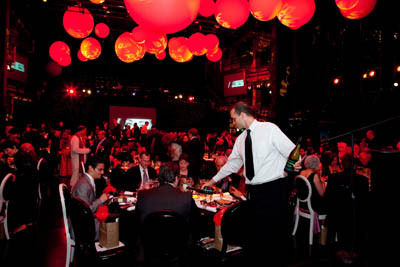 The Berkeley Repertory Theatre held their annual fundraising gala this April at the Roda Theatre, and JMP was proud to be a part of the event. 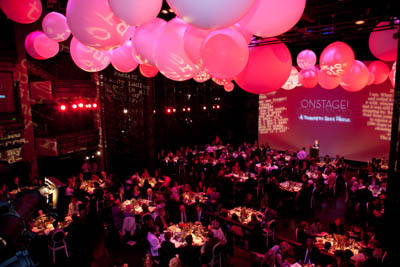 Working in conjunction with event planner Marjorie Randell-Silver of Copper Leaf Productions, we learned that budget constraints can result in boundless creativity. Inspired by the concept of bringing the audience onstage, the theatre was transformed by using stage decks to elevate guests to stage level. 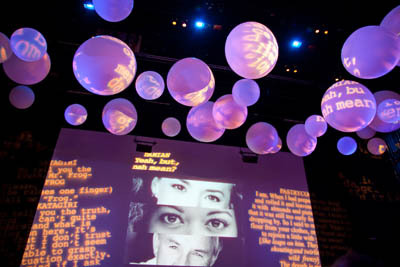 Balloons in various sizes dotted the ceiling, with excerpts from the theatre's most recent plays projected on their surfaces. Bold use of color also added to the effect, with the entire lobby and patio windows covered in a translucent green vinyl covered with text. 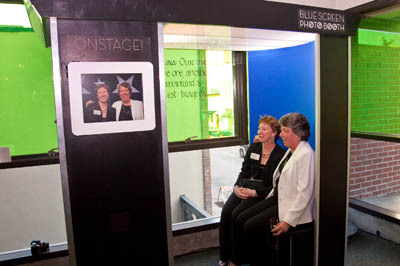 The event was a huge success, raising over $137k for the theatre.